So I am writing this post as I try to help my sister create her wedding centre pieces. There are so many eco friendly and budget friendly ideas out there for your wedding decor. I think being eco friendly and budget friendly go hand in hand, after all re using and not creating unnecessary waste is totally both! Many of our ideas here also show how you can add more meaning and uniqueness to your wedding decor. We know you agree that a wedding is a special time and thoughtful as well as beautiful items add value to your day. We would love to hear how you are thinking of styling your tables so share with us at the end! Keep the flowers simple and structural. This beautiful wedding table is filled with vintage glasses and the minimal flowers keep costs down. In this setting choose your flowers wisely, ones that are bold colours with a strong shape and greenery lend well to this look. This setting is by Bohotanical. View the full styled shoot. 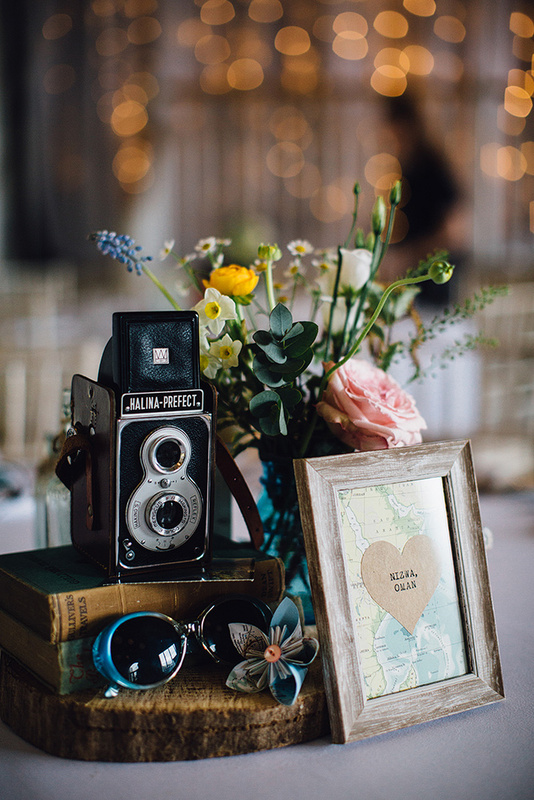 Using old items from around the home or maybe collected from charity shops you can create a beautiful centre piece for a vintage style wedding. I'm a big sucker for old books, the smell, the appearance and feel. Books deserve more than just a shelf so show them off at your wedding! Books collected could be provided by family members and each one given as it means something special to that family member. Look around your home for inspiration. Collect objects you treasure and that represent you as a couple to style your table. I love that this picture on the left also uses herbs, Basil post would provide wonderful bright green and be perfect if you were having pizza!! You could write a little card for each table explaining the curation and what each object means to you both. This option is quite possibly the most budget friendly and eco friendly I can think of as it costs nothing, it all gets used again and you don't spend money on cut flowers. What could be more romantic than a venue filled with beautiful candles flickering? If you are having a late wedding or a winter wedding then this is a simple, elegant a beautiful wedding decor option. This image by Sarah Gawler Photography. Click this link to view this stunning wedding!! This image from Mod wedding. I love this one, another simple option and an excuse to work through that liqueur cabinet!! Visit your local florist for some greenery and baby's breath to create the centres yourselves. An easy option to arrange if you are DIY-ing the day before or if the venue are arranging for you. Throw in some colour with a variety of bottles or a table runner.